Learn more about Camellia Gardens in Monroe, NC. Our venue is perfect for weddings and special events you would like to hold in a stunning outdoor setting. Purchased in 1987, our first renovation on this working farm was to build a lake as the focal point of the property. Within two years, our home was completed, and our new family was moving in, adding swings to the oak trees, and telling stories underneath the grand willow oak. We built a barn and pastures for our horses, and we added thousands of plants that we loved. In 2007, we completed the construction of our gardens and opened for business as a nursery and garden center. Sadly, the great recession swallowed up the landscaping budgets of homeowners, and we closed the nursery business in 2009. 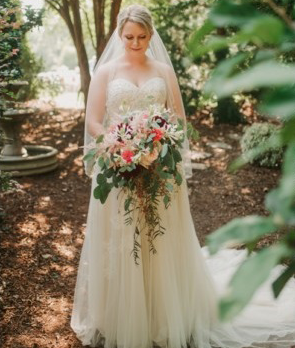 Because we had hosted weddings on our property and held dozens of parties and events that created so many happy memories, it was a natural progression to share our beautiful gardens, barn, arbor, and terrace with others. Now you can experience the romance of Camellia Gardens, the perfect place for your wedding or special event. Contact us today to schedule your visit and consultation. Our goal is to create a place where our gardens, lakes, lawns, and landscaping will be the perfect backdrop for an unforgettable ceremony and reception. Say "I do" beneath the shade of the grand oak, dine beneath the stars, and rest assured that rain will not spoil your day. Trust your wedding to professionals. Let Camellia Gardens create the perfect day for the beginning of your new life together.